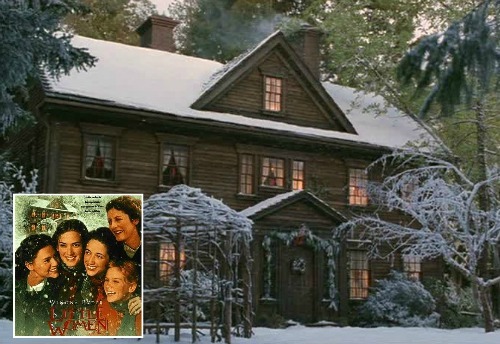 When I asked you which Christmas-movie houses you’d like to see that I hadn’t featured yet, I got a lot of requests for Orchard House from the 1994 version of Little Women. I thought that was a great suggestion, so I watched it again over the weekend and revisited the warm and welcoming home of the March family. The sets in this one really are gorgeously done. The exterior was built to look like the real Orchard House that was the longtime home of Amos Bronson Alcott and his family, including Louisa May Alcott, who set her novel there. 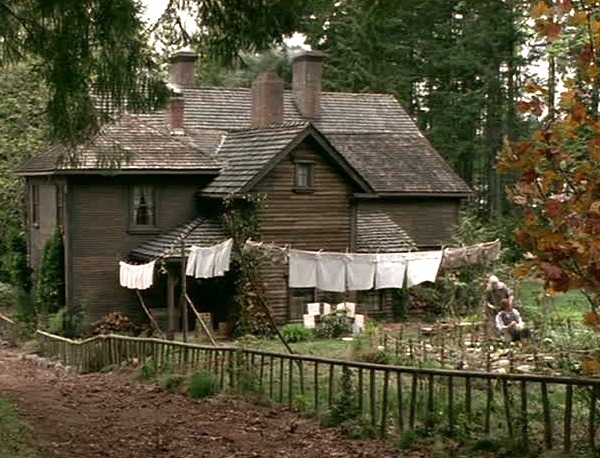 The exterior of the house in the movie was built on Vancouver Island in a forest where there were two houses already built next to each other. They constructed new facades for each of them. 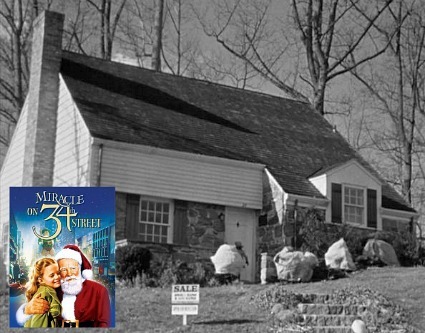 The location was chosen because there was a second house already next door, which was necessary for the story (Laurie, played by a young Christian Bale, lived there), and the driveways connected. The movie was filmed at the beginning of summer in Vancouver, so they had to add the snow to make it look like winter. Laurie’s house is a complete facade in front of a real house that the owners continued living in during filming. The director, Gillian Armstrong, points out that it must have been dark in there! 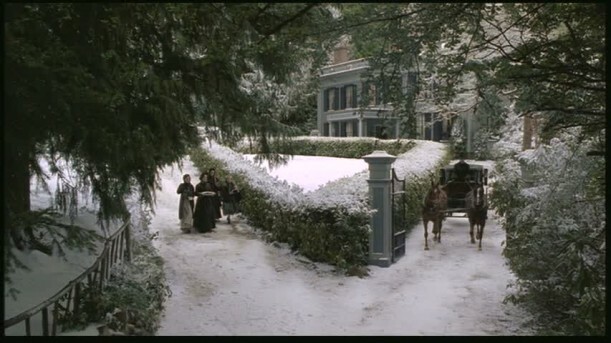 The opening scenes of the town were shot in Deerfield, Massachusetts, in the winter (real snow). This was the first film that had ever been allowed to shoot there. They made an exception for Little Women because Louisa May Alcott was from the area. The interiors of Orchard House were built on a soundstage, and that’s where the majority of filming was done. The Production Designer was Jan Roelfs and the Set Decorator was Jim Erickson. 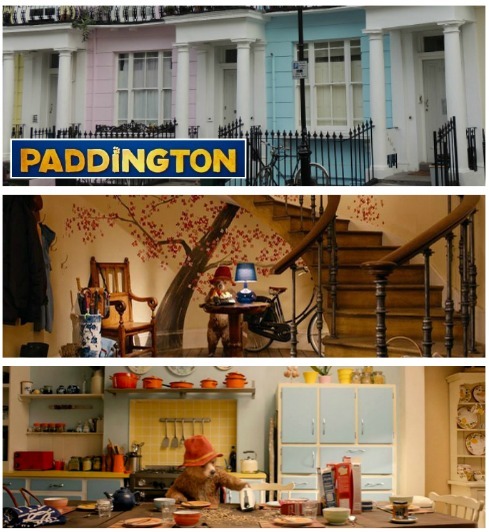 They really did an amazing job bringing these houses to life and making them feel like they were real, and had real history in them. 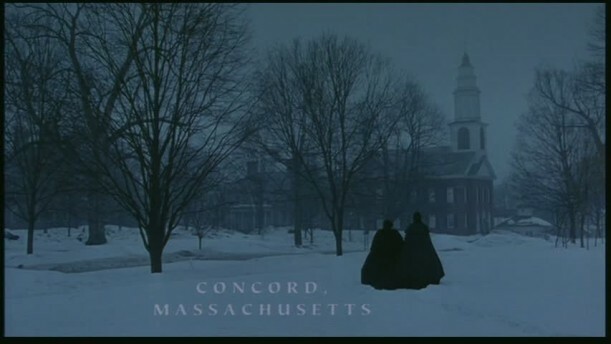 Gillian Armstrong, the director, explained in the DVD commentary that although the sets were built to resemble the real Orchard House in Concord, Massachusetts, where Louisa May Alcott lived, the rooms had to be built bigger to accommodate the filming equipment. The colors are much starker and the look is more formal inside the real Orchard House, as you can see on the museum’s website. Most of the furnishings in the Orchard House Museum belonged to the Alcott family, and the rooms are kept the way they did when they lived there. I’d love to see it in person someday. The filmmakers wanted their version to look warmer than the real thing. They chose “restful, earthy colors in the greens and grays so everything blends together and feels as one in the home,” according to Armstrong. The Alcott family bought a 12-acre apple orchard in 1858 that came with two early-18th century houses. They moved the smaller of the two houses onto the back of the larger one and named it Orchard House. Alcott based the Little Women on her real sisters and gave them all different names except for Beth, who had died. She said she couldn’t bear to change her name — she wanted the character to be as exactly as she remembered her sister. Mary Wickes played Aunt March. (Loved her in White Christmas.) She died a year after the movie came out, in 1995. The movie wasn’t greenlit until Winona Ryder, who was a rising star, was cast as Jo. 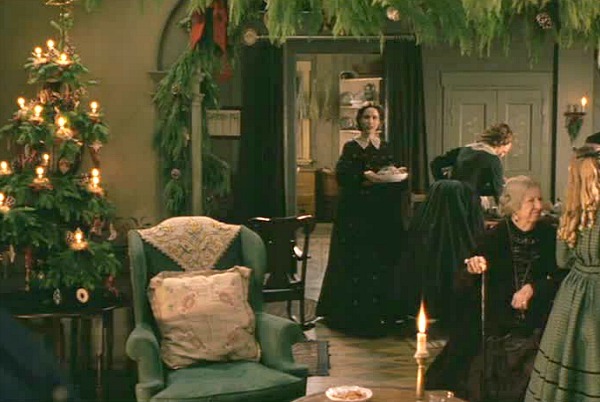 The cast had to take knitting and etiquette classes so they would know how to behave like young ladies of the 1860s. 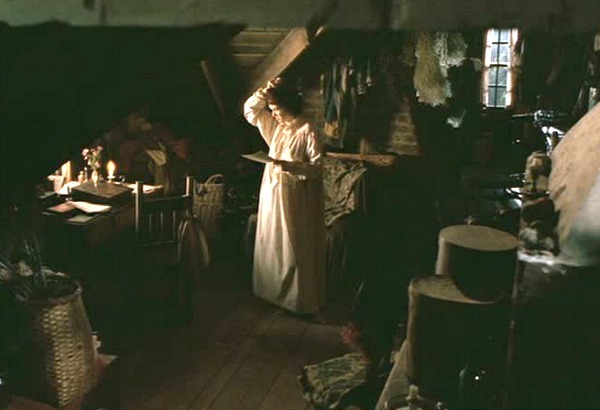 The screenplay had the movie opening with the girls acting out one of Jo’s stories in the attic. They later decided it made it too hard to get to know the characters, and the new beginning was shot of them wishing each other a Merry Christmas. Here grown-up Amy (who was played by Kirsten Dunst in earlier scene) visits her sisters Beth and Jo in the attic. 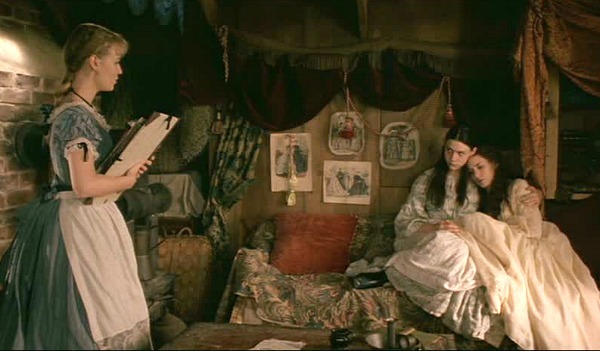 Amy, who was a budding artist in the novel, was based on Alcott’s sister May. She never became a successful artist as she hoped. She illustrated the first edition of Little Women, but her artwork got negative reviews. May/Amy did, however, teach Daniel Chester French, who became an artist and sculptor. She gave him the tools that he eventually used to sculpt the statue of Lincoln that sits in the Lincoln Memorial. Pretty cool, right? When May died, she left behind a 2-year old girl called Lulu. Alcott took the toddler in and raised her. One major change Alcott made in the story is the ending. Jo falls in love with a German professor and marries him. But in real life, the author had no real interest in men and never married. She did, however, have a romance during her time in Europe with Ladislas Wisniewski. She later said that “Laddie” was the model for the character of Laurie in the book. This was one of my favorite books as a girl — I had the big illustrated “Junior Version” (above). After I told my husband I wished I still had it, he found one on eBay for me for Christmas. How sweet is that? It was one of my favorite gifts this year. Note: Most of these photos are screenshots I took while watching the movie, and the info about the sets came from the DVD Special Features. Jason Bateman's House in "The Change-Up"
This is one of my favorite Christmas movies too! Just by chance I caught an earlier edition, the one with Elizabeth Taylor, on TCM last week. The story is very, very close to the Wynona Ryder version, but the sets in the earlier are a bit grander. Wonderful post! I live jealously close to Orchard House, and take all my guests there when they come for a visit. I would be more than happy to be your personal Boston-area tour guide. I love the variety of houses this area has both in style and age -you would die! Love reading your blog, just let me know when you want to visit! So excited to see this Julia! I just received the DVD for Christmas from my lovely husband, and I can’t watch it until tomorrow!!! Looooove the story you give of the filming and the real house and Louisa May Alcott’s real life parallels. This was one of my fave books as a girl too. I even read Little Men! Thanks for featuring this house! 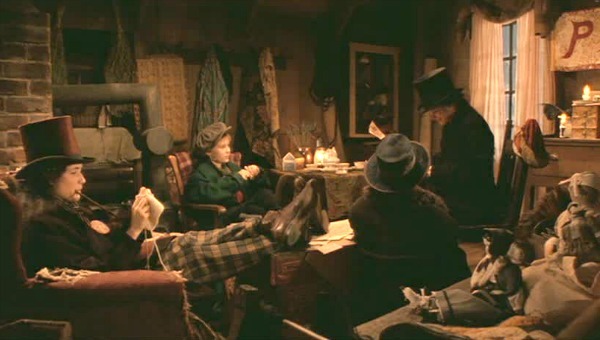 I always watch Little Women when I do my Christmas wrap-a-thon. I have loved the book since I was a girl and thought this film version did the book justice. How sweet that your husband found a copy of the edition you had as a kid. I still have mine! I have that exact edition of the book! I love the illustrations. 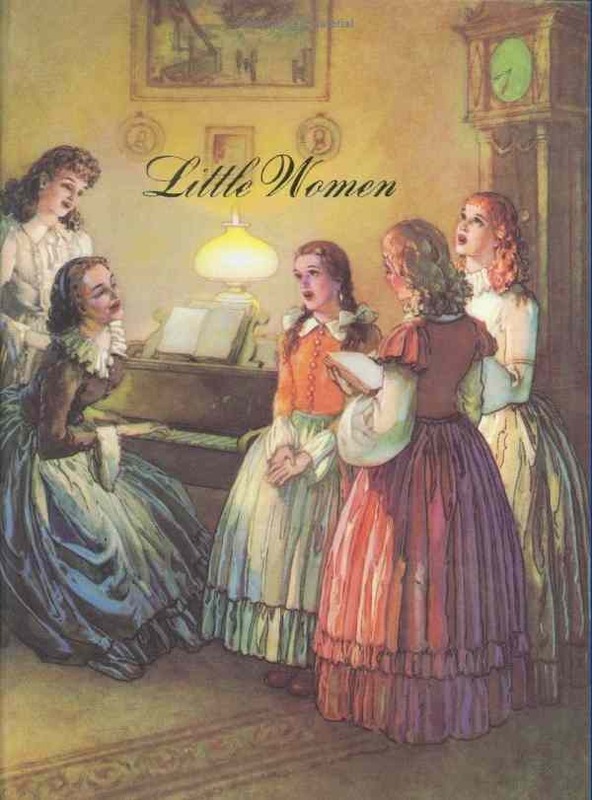 This would be my favorite rendition of Little Women if it were not for the 1949 version with June Allyson, the one I had grown up with, and is so dear to my heart (watched it last night as a matter of fact). I thought Winona Ryder was perfect as Jo, and Susan Sarandon is a fantastic Marmee. I live not too far from Concord, and every Christmas I say to myself I have to get out there, because they have tours, skits, but another Christmas has come and gone, and I have not yet made it there. Hopefully next year! Thanks once again, Julia, for your lovely posts, and Happy 2012!! Hi Julia-this is my first comment-I LOVE your website and I loved having a look at this house especially because my home was built in 1816 and I keep wondering if I should paint all of my trim in historical colours (it’s currently white). What actually did inspire me to post today for the first time was how happy I was to read how your husband found this book for you on ebay! He is definitely a keeper (unlike ALL of the presents my husband randomly bought for me!) Haha! Have a wonderful new year! I loved your post! So many interesting tidbits that I never knew. Thank you! There is a house about 5 minutes from my home in Ohio that was once owned by a neice or nephew of Louisa May Alcott. Ive never done any research on it but I did write a brief post on it once. “I have nothing to give you, my hands are empty.” “My hands are empty now” says Jo. The beautiful music. I have watched this over and over and still the tears come. Yes, it is interesting that Louisa May Alcott never married. That is beside the point, she was a historian of the times in which she lived. Just like Emily Dickinson and Nathanial Hawthorne, whose homes we are able to tour. I would like to see those homes here on Hooked. I went to Orchard House in Concord, MA a few years ago with my Mom and Granny. We all love the story and the movie. It was such a thrill to tour the home. We were there in the fall and oh my, so beautiful. Thank you for this post. I need to watch this movie again!!! I loved this post! I used to read Little Women over and over again as a young girl! Makes me want to go out and buy a copy! This is one of my favorite movies. Thank you for taking the time to write about it and giving so many details that I never new about! I swear, Julia, between your well-chosen screen shots and your terrific commentary, your Movie House posts are better than watching the real movies any day. Who needs dialogue, acting and plots when you can have great stills of the sets and lots of interesting houseish background? I have the same edition of Little Women that you have. I found mine in an antiques mall a year or two back. That’s so sweet of your husband to give you a copy of your childhood favorite. You know, I just realized that most of my favorite childhood books feature a house as an important part of the background and even of the plot. Julia, I agree with Junie .. your behind-the-scenes commentary and pics are amazing! I have yet to see the movie; it’s been on my list to rent, but it’s always out! Maybe this week ..
What a wonderful husband to find you a copy of the book you used to have .. he’s a keeper! Thank you so much for featuring this movie. “Little Women” is one of my absolute favorite movies. I love it so much I ended up getting it on DVD not too long ago. I love the people they chose to play each character. They play their parts great. 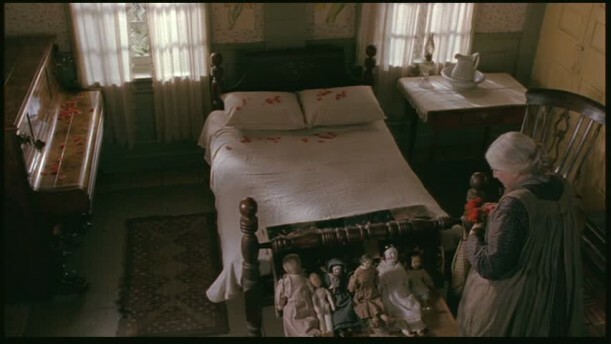 I love the warmth and inviting feelings of the house, I get each time I watch the movie. The interiors are so much better looking than the ones in the real house. I also love Aunt March’s white house. It’s gorgeous especially with that beautiful curved staircase. I can’t believe after watching “Little Women” so many times, I never noticed Mary Wickes was in this movie playing Aunt March. She did such a good job. I love this film, the novel, as well as the film version with June Allyson as Jo. I have fond memories of being curled up in my personal tiny guest room at my grandparents house & reading this novel before bed when I was a child. This is one of my favorite movies, and it’s traditional at our house for us girls to watch it together during the Christmas season. Well, since my older daughter married and moved away my youngest and I watch it together. Thanks for the background on the movie houses, I always wondered how they did that. I, too read the book many times as a child. My copy, which I still have, was given to me by my grandma when I was 7 years old. I treasure it! I absoloutely adore this book and the movie! I was living in Victoria when they were filming the movie (would have been around 93 or 94). They had the road in front of my apartment blocked off, where they were filming some of the ‘city’ scenese. They had horse drawn carriages, and decked out the area to resemble a street of the 1800’s. The March house in the film is in Cobble Hill. My grandmother lived quite close by, and we drove by the house. They also had a Christmas tour in the home, but we never got a chance to tour it. Thank you so much for this post! My daughter got me this movie for Christmas just yesterday and I stayed up after the house was quiet watching it into the wee hours. I loved the house (again–I’ve lost count of how many times I have watched this great movie) and I wondered if it had been featured on your blog. Then I got up this morning and found your wonderful post in my Reader queue! My favorite bit of trivia was finding out that the exterior shots were from B.C. I live near Olympia, Washington, where we share the same climate and vegetation and it is always a treat to see our beautiful part of the world on film. This post was an awesome Christmas present! Even though I now live in Atlanta, I grew up , and until recently lived, close to both Concord and Deerfield, (Home of Yankee Candles!) Massachusetts. Orchard House is still one of my all-time favorite places to visit and every time we go home, we still do. I love everything about feisty Louisa May! We have even been known to visit nearby Sleepyhollow Cemetary where the Alcotts and several other famous locals are buried. (Thoreau, Hawthorne, The Alcotts and Emerson) If you ever get a chance to visit the Boston area, Julia, Orchard House is a must-see! As much as I love Louisa’s books, and “Little Women” the movie, it is her real life antics and adventures that I adore the most. Looking forward to what you are going to share with us in 2012! I got sidetracked.. now it has a name –house lust !!! Thanks, Julia. Only problem is, I don’t want to be cured. 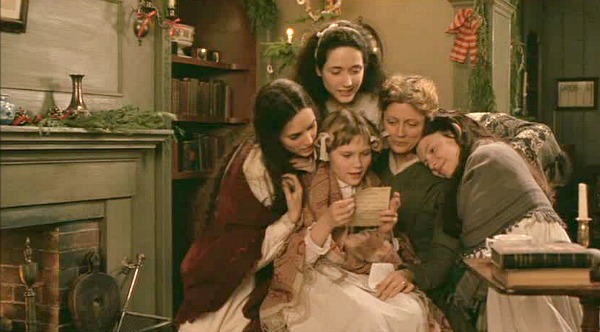 little women is, to me, one of the perfect holiday movies. 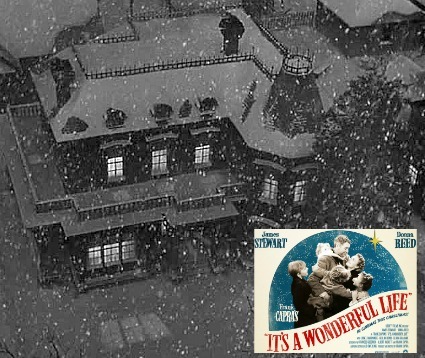 an almost perfect adaptation of a perfect novel, perfect cast, perfect sets and costumes, perfect atmosphere all resulting a the warm, christmasy feeling i love getting from a christmas film. thank you for the lovely post, reading through it is a nice way to wind down from a frenetic, although fun, holiday. I have visited the Real House. Hope you can some day, also. Awesome house. I would love to see how it’s normally decorated. Loved this post! I have the same edition of the book. I’ve read it so many times since receiving it as a child, and it’s always had a place of honor on my bookshelf. Seeing the cover art on your blog makes me want to read it again! I really love the sets from the movie… I love every detail. Thanks so much for featuring Orchard House! Love the post! I also like that they changed the ending in the movie so that Jo found love too! But best of all… I love (!) that your husband found you a copy of the book like you had before. Ahhh….Definitely true love! I just love mush! Thanks for sharing! Wonderful post, Julia! I saw this movie years ago and later bought the DVD but had since forgotten about it. Now I feel compelled to find it and watch it again. 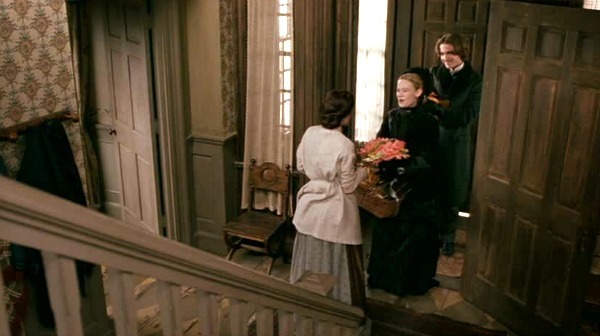 Of all the movie versions of Little Women that I’ve seen, this is the one that really got to me on an emotional level. Susan Sarandon was particularly good, but Winona Ryder held her own too. For me, personally, Katharine Hepburn’s portrayal of Jo March in the 1930s movie came closest to the way I always saw that character while I was first reading the book. To me she will always be Jo. Perhaps that had partly to do with Hepburn’s New England accent, which, BTW, is my only real criticism of the this particular version of the story. No women in 19th century Concord, Massachusetts spoke with a modern American accent the way all these 20th century actresses did. Heck, even today most people in Concord still speal with at least a slight NE accent. But that really is my one and only complaint. They did do a wonderful job with everything else, particularly with the warm and homey sets. I love knowing how these set deisgners’ minds work, especially when they’re recreating things from such a classic, well-loved story. Thank you so much for doing this one! 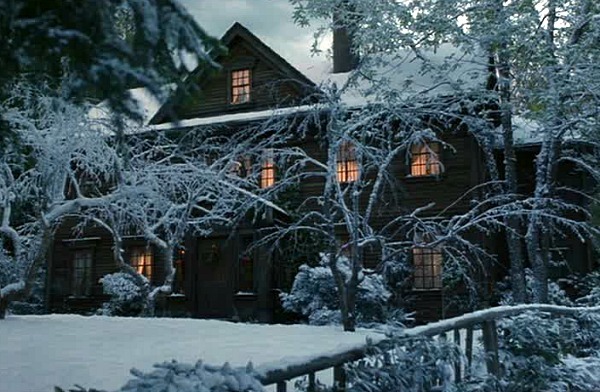 I adore this movie, and I looooove this house. I always watch the movie twice in a row: once to watch the movie, and a second time to concentrate on this beautiful house! 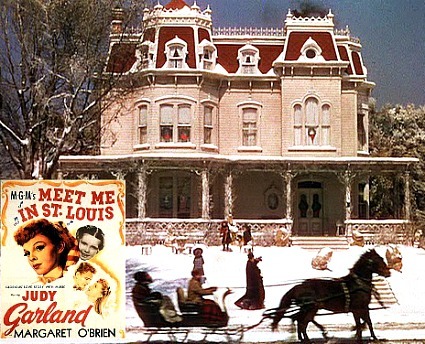 Thanks for a wonderful look back at one of my favorite films AND books! I recall getting this book in grade school and re-reading it until it fell apart. I always identified with Jo, though did share Amy’s obsession that my nose wasn’t “perky” enough! I’ve been past Orchard House many times, and after seeing your photos of it on the other website, vs. those of the film, I think I’ll pass! It was a great decision to film the wide exteriors in Deerfield, since the topography is very similar to that of Concord; the Deerfield (and Connecticut) River valley is rather flat, with a few low, wooded hills. Concord is so built up now, you would never mistake it for anything 19th Century! 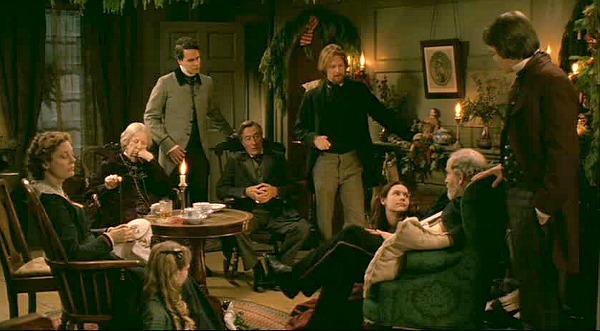 As for the accents in the film, it is very difficult to assume that the March family spoke like modern-day Bostonians. More educated people with wider contacts often tend to moderate their speech. If you travel west of Worcester, you will rarely hear anything like a “Massachusetts” accent! Besides, I’m glad they didn’t try to replicate it, as it’s VERY hard to do. If you’ve seen Mass. films like “The Departed” or “The Perfect Storm”, the only ones who ever get it right are those who grew up here, like Matt Damon or Mark Wahlberg! Wise directors let the actors simply modulate their accent, as Robert Redford did in “Out of Africa”; his British accent was apparently awful! I can’t imagine Winona Ryder saying “Cahpet” or “ovah theyah” with any accuracy. Makes me cringe, just thinking about it! Gwynneth, I agree that it’s not safe to assume the Marches/Alcotts would have spoken with a modern Boston accent – actually several different accents can be heard in Boston today – but it is entirely safe to assume that they did not use the hard Midwestern R that emanated from every actress in this movie. Louisa May Alcott (pronounced ALL-kut) and her family would certainly have dropped their Rs, just like everyone else raised in that area during the 19th century did. It’s not car, it’s cah. It’s not MAR-mee, it’s Mah-mee. And every time I hear an actress say “MAR-mee,” I myself cringe a little. Come to think of it, Winona Ryder’s unmistakable Midwestern twang in “The Age of Innocence” grated on my nerves as well. Wealthy 19th century New Yorkers, especially “Society” types, simply didn’t speak the way she does. And I always feel like if they’re going to do a period piece and they invest the time and money in making the sets and costumes historically accurate, they ought to go the extra mile and try to get the accents, cadence, dialect, and vocabulary right too. Unfortunately this is happening less and less as America’s regional accents and speech patterns are becoming more and more homogenized. What a fun post! I love it! I was looking at Madame Alexander “Little Women” dolls just this morning. I have loved this movie for so long. I have 4 daughters as well and we have watched this movie until it finally had to be replaced! Someday I hope to visit the original Orchard House, but for now I have enjoyed the tour you provided! 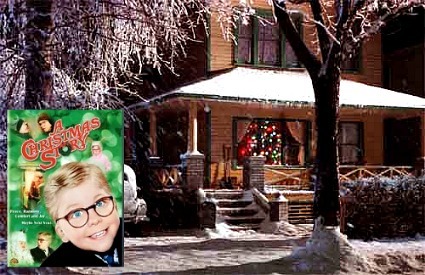 This is my favorite movie so I was really excited when I saw you featured the house. Thank you so much for taking the time to put this together. I loved learning more about the movie and Louisa May Alcott! Reading you blog this year has been a true joy to me . I wish you and yours a most joyous and prosperous New Year! This is one of my favorites! Love the movie as well as the sets. Also if you’re a fan of the film, check out the soundtrack/score by Thomas Newman. It’s incredible music for an equally wonderful movie. I seem to recall reading just the very beginning when I was young and never finishing it. I guess I have a new book to start! My daughter and I read Little Women and then watched the movie on Christmas Eve! Thank you for sharing the behind the scenes! Thank you so much for this lovely story of the production behind “Little Women”. It will forever be one of my most favorite Christmas movies. I was most fortunate to have been am extra in the movie when they filmed the scenes at Craigdarrich Castle in Victoria, BC (where I’m from). I know the Castle like the back of my hand since being a long time volunteer and decorating for Christmas every year. It was a most delicious experience, one I will cherish forever (although the wardrobe was very uncomfortable and the hours were long. We also had to stay out of the sun to be as pale as possible 🙂 Hard for a young girl in the summer. Most enjoyable to revisit this time. I’m just catching up on posts after the holiday and here you are, posting to my heart and soul. I have loved Little Woman for as long as I can remember and love all three movie versions, but, enjoy this one the most. We visited Orchard House and all of Concord about three years ago. It was a most amazing experience. A good deal of the woodwork has actual artwork done by Amy/May and is so wonderful to see. 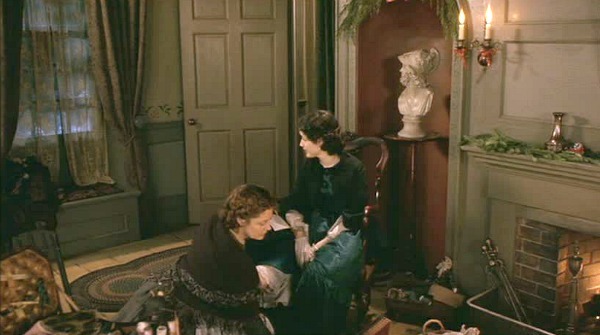 The best is the little desk that Louisa wrote Little Women on. 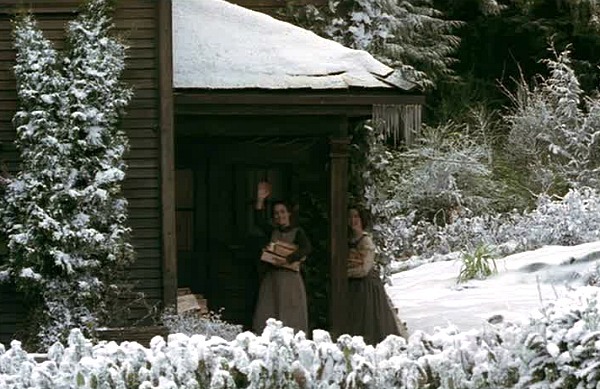 I hope you get to see the house sometime, Julia, as well as the cemetery where Alcott is buried near Emerson and Thoreau, and to go to Walden’s Pond and imagine the scene where Amy falls through the ice. Thank you for awakening a wonderful trip and reminding me anew how much I love the story of these little women. Love this post. Little women was my favorite book and I was so happy when this movie came out. I’ve been meaning to watch it again this holiday season but haven’t done it yet. I adored this movie and loved reading more about it here. Can anyone tell me, was the final scene with amy and her love in the rainy lush green forrest also shot on vancouver island, or somewhere else? I loved it. Thanks so much. Probably! But it’s been so long since I wrote this post and watched all the behind-the-scenes features on the DVD that I don’t remember if they mentioned that scene specifically or not. Does anyone know? 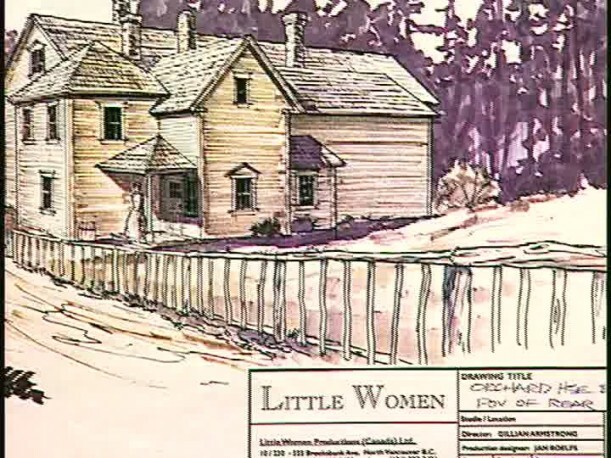 I was looking for photos of Little Women’s Orchard House for an interior design project I was doing and then I found yours and they were so helpful!!! And the same happened with Kathleen Kelly’s apartment in You’ve Got Mail. You have no idea how much you helped me by posting these photos :). Thank you!! !